Dogecoin continues it's ascent today leading up to September 5 when the demo of Dogethereum will be released. The upcoming demo of Dogethereum has sent the worlds favourite canine coin up into double digit gains. Looking at Doge's movements we can see that when Doge pumps it pumps hard. Though Dogecoin has gained significantly the last few days we can expect that the pump is not done yet. 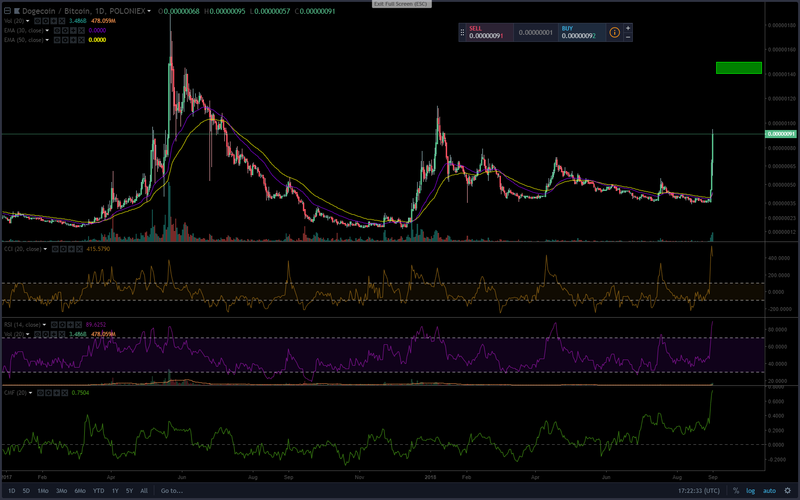 We'll be targeting the fibonacci extension which will give Doge an expected target of 140 - 150 sats around September 4 or 5. The catalyst for this pump has been Dogethereum. Sentiment is also shared with charting from Richard.